Let me begin by admitting that I am a long-time fan of Craftlit, a fantastic podcast that combines the joys of craft (knitting and more) with the wonders of classic literature. 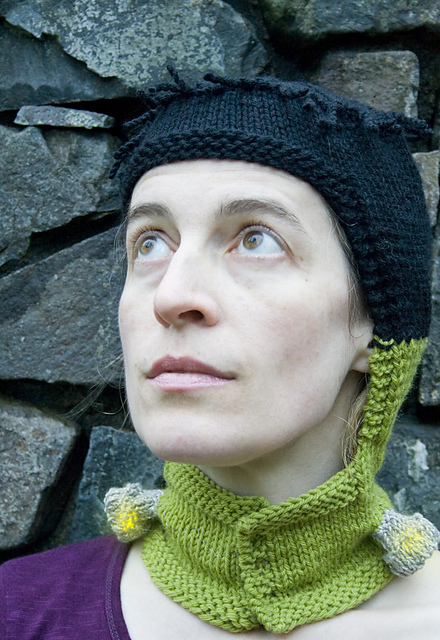 The host, Heather Ordover, “is an award-winning high school and university teacher who also happens to enjoy knitting. The podcast starts with a little crafty talk, then moves into explanatory notes on the chapters covered in that episode.” That last bit has been crucial for me — Heather has single-handedly rescued classics from my mental dust-bin. Remember that dense tome you skimmed through in high school, reading just enough to get by and write some semblance of a final essay? Heather’s enthusiastic and down-to-earth introductions to each episode breath life into these dusty stories by putting them in context and making them exciting again. I personally gained a whole new appreciation for “The Scarlet Letter.” I have loved “Pride & Prejudice” for some time now, but listening chapter-by-chapter with Heather was so much fun! Right now we are finishing up with “The Woman in White,” a novel that I have never heard of before, but I am now entranced by. It’s a real nail-biter — full of mystery, suspense, and twists that M. Night Shyamalan would pay for. I suppose it is a bit ironic that one of the few books I wasn’t able to get into is the inspiration for a wonderful new book of knitting patterns and more. Craftlit brought us “A Tale of Two Cities” in 2007, and although I really, truly, deeply desired to be as excited about it as Heather and (seemingly) every other listener, I just couldn’t do it. I’m ashamed to admit that by the halfway point, I’d stopped trying. I still listened to the crafty portion of the podcast, but as soon as the conversation moved on to Dickens, I pressed “next” on my iPod. That said, from what I gather, Madame DeFarge is a quite a character. According to the foreword, she “was keeping a record of the names of the doomed” hidden in code in her knitting. How cool is that? 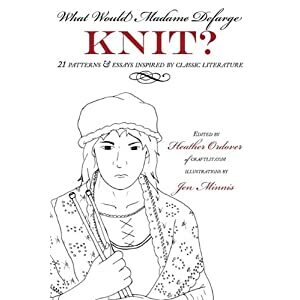 “What Would Madame DeFarge Knit?” is no ordinary knitting pattern book. For one thing, instead of lavish (read: expensive) color photos, the book features clever black-and-white “woodcut” illustrations by Jen Minnis. Color photographs and much, much, much more are available online, through the main WWMDfK? site and (of course!) Ravelry’s source page for WWMDfK?. At first I was disappointed with the lack of clear photos of the patterns. I’ve been accustomed to my knitting pattern books doubling as coffee-table books, full of glamour shots of the finished objects. The more I thought about it though, the more I realized that I never go by just the book photos anyhow–I always check Ravelry to see what others have done with a pattern. The illustrations have a charm all their own, and lend an old-fashioned air to whole enterprise that suits a book of patterns that are inspired by classic literature. Another draw to this particular book is that it is one of the first books published by Shannon Okey‘s Cooperative Press. This indy publisher uses a different model for compensating designers: instead of buying patterns outright, they provide something like royalties. I don’t know the details of the WWMDfK? deal, but I’d be willing to bet the designers are getting more than they would through any other publisher. Frankly, there’s a good chance this book wouldn’t even be released through a regular publisher, which would be a crying shame. Each of the 21 patterns is accompanied by a short essay by the designer. 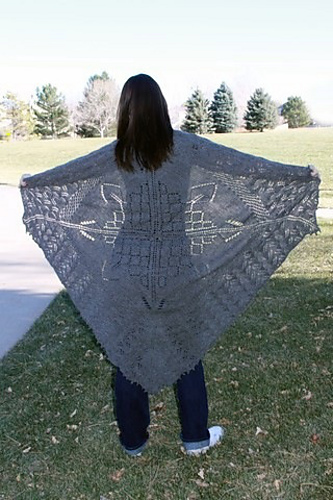 One of my favorites is the first in the book: the pattern for Jane’s Ubiquitous Shawl (by Erica Hernandez) is sprinkled with quotes from Jane Eyre. I imagine knitting this pattern and reading along, with a virtual Jane sitting nearby and chatting. The patterns aren’t just for knitters: Dawn Ellerd‘s Not-So-Ruby Slippers (a nod to the sparkly red shoes from the Oz movies that never appear in the books) are crocheted in 11 quick rounds from superwash worsted-weight yarn. I’m not usually a “crochet” person — I have, in fact, been heard to say something like, “I can crochet, I just choose not to.” However, I might just make an exception for these quick and pretty slip-ons. 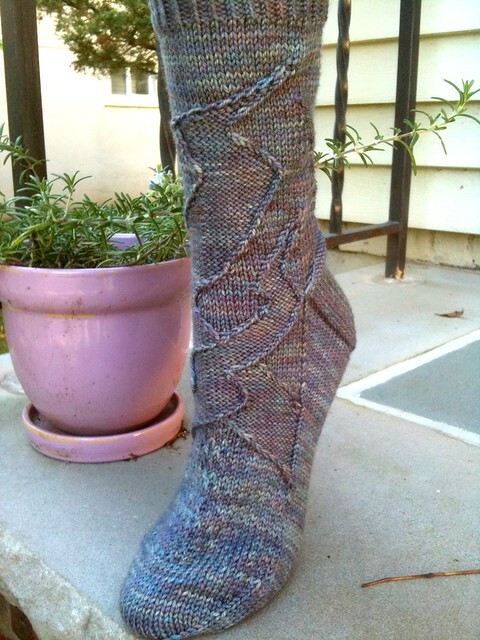 Another fascinating non-knitting pattern is “The Mermaid’s Lagoon” by the aforementioned Jen Minnis. The book includes paper patterns for a whole cast of shadow-puppets based on J. M. Barrie’s “Peter Pan.” The evocative silhouettes are beautiful and just beg for story-telling. Back to knitting! Two patterns that are definitely in my Fantasy Queue are “Bertha’s Mad, Mysterious Cowl” (also by Erica Hernandez) and “Hyde’s Hooded Sweater” (by Gretchen Funk). 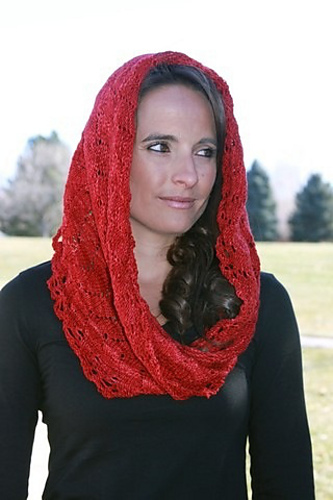 I imagine making the cowl out of some luscious tonal colorway … in fact, I had set aside a skein of Stroll Tonal in “Gypsy” for this project, but it was diverted into a lace knit-a-long (check out my “Red Seas” shawl!). I love the Hyde hoodie, especially the button-up hood that doubles as a dramatic collar. If I had the funds, I would buy some Stroll WotA in “Deep Waters” — on sale at 25% off as I write. Sigh, alas! I may never actually make my own Frankenhood (by Syne Mitchell), but I truly appreciate the detailed tutorial on making the light-up LED neck bolts. 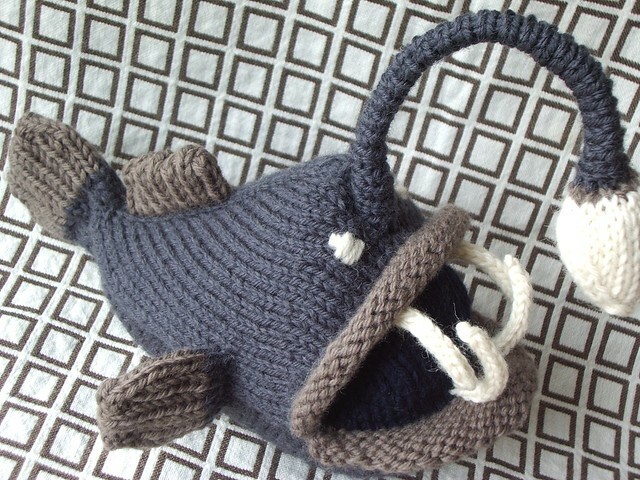 I haven’t made many amigurumi lately, but I’m thinking that making a Deep Sea Anglerfish with an actual light-up lure would be exceptionally cool. Two more patterns for my Fantasy Queue: Wilhemina’s Shawlette (by Chrissy Gardiner) and Cthulhu Waits (by Hunter Hammersen). The latter appeals both for the literary inspiration (I am a fan of all things Cthulhu) and for the asymmetrical wandering tentacles. My only concern is that I frogged a sock project yesterday, because diagonal lines like this pulled uncomfortably when I tried on the sock. The shawlette is probably going to be part of a Craftlit knit-a-long this fall, to accompany the reading of “Dracula.” I shall be disciplined and wait until then! 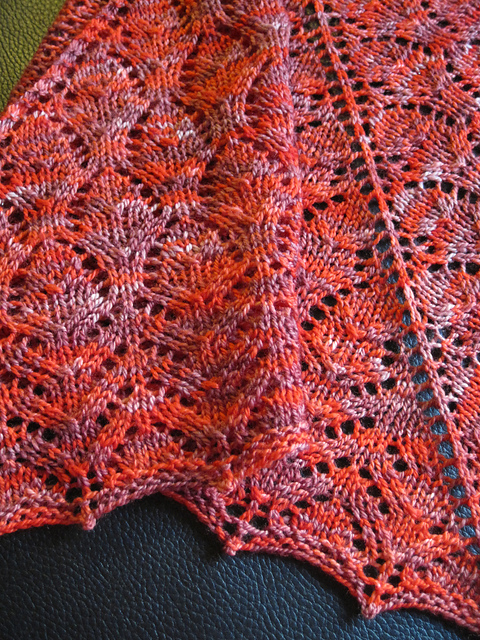 I love the pattern for Madame Defarge’s Stole (by editor Heather Ordover): the lace bits are lovely, but the best and most interesting part is the seamless, graft-less construction. 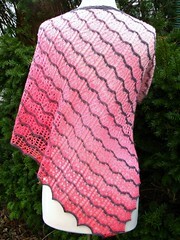 The unique (or at least new-to-me) method alone makes me want to make this lacy stole. So — there you have it. A great book chock-a-block full of interesting patterns and essays for the literary-minded crafter. Support indy publisher and indy crafters alike, and buy yourself a copy of this book. You won’t regret the purchase. Categories: Book Review	Tags: book review, heather ordover, jen minnis, what would madame defarge knit?, wwmdfk? You have no idea how good it feels to know that you like (and “get”) this book (and the podcast too)–and no, you’re not alone on not liking TofTC. Dickens wasn’t a fave of every listener. You made a good baby! I mean, book. 🙂 You’ve been my podcast companion on many a long drive. I’m glad to pay back just a bit of my karmic debt. Which is to say, you’re welcome!